William Edwin Starke (1814 - 1862) was a wealthy Gulf Coast businessman and a brigadier general in the Confederate army during the American Civil War. He was killed in action at the Battle of Antietam while commanding the famed Stonewall Division, a unit first made famous under Stonewall Jackson. Starke was born in Brunswick County, Virginia. 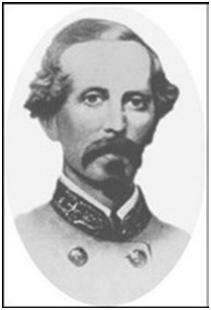 His youngest brother, Peter Burwell Starke, also became a general in the Confederate army, as well as a Mississippi politician. Prior to the Civil War, the brothers worked in the family's stagecoach business that operated between Lawrenceville and Petersburg, Virginia. In 1840 William Starke moved to the South, becoming a successful cotton broker in Mobile, Alabama, and New Orleans, Louisiana. In 1858 he purchased the SS Texas Ranger, a former supply ship, from the federal government and used it to haul cotton to his customers. Starke was married to Louisa Grey Hicks, the daughter of a prominent Brunswick County businessman. Their daughter, Sallie, was born in Melrose, Alabama. At the outbreak of the Civil War early in 1861, despite his lack of formal military education, Starke was named as a lieutenant colonel of the Fifty-third Virginia Infantry until June. He subsequently was an aide-de-camp to Gen. Robert S. Garnett in western Virginia, but was without a position following Garnett's death in the battle of Corrick's Ford. His coolness and judgement in the midst of the confusion that followed the death of General Garnett were highly commended by Col. William B. Taliaferro, who succeeded to command. Starke temporarily served on the staff of Robert E. Lee in August 1861. Later in the year, he received a commission as the colonel of the Sixth Virginia Infantry. He led the regiment during the 1862 Peninsula campaign. He was wounded in the hand during the Seven Days' Battles on June 26, 1862, but resumed his duties after a three-day recovery period before finally relinquishing command after the battle. For his gallant efforts during the fighting, he was commended twice and then promoted to brigadier general on August 6, 1862. He was assigned command of the Second Louisiana Brigade. He led the Stonewall Division during the second battle of Manassas following the wounding of General Taliaferro. For unknown reasons Jackson decided not to leave him in permanent command, appointing a staff officer (John R. Jones) instead. In mid-September, Starke's Brigade was part of the force under Stonewall Jackson that captured the large Union garrison at Harpers Ferry, after which they marched into Sharpsburg, Maryland, on September 16. A strong Union attack on the morning of September 17 drove back the Confederate lines. Starke was shot three times and died within an hour. He was one of six generals killed or mortally wounded at Antietam. His body was buried in the Hollywood Cemetery in Richmond, Virginia, next to his son who had been killed two months earlier at the battle of Seven Pines. A mortuary cannon on the Antietam Battlefield marks the approximate place where Starke was shot the third time, west of the Hagerstown Turnpike in the West Woods area. It was dedicated in October 1897. Source of information: Dolliver, Louise Pearson. Lineage Book, Volume XVII. National Society of the Daughters of the American Revolution, Harrisburg, PA: Harrisburg Publishing Company, 1904. Eicher, John H., and Eicher, David J. Civil War High Commands, Palo Alto, CA: Stanford University Press, 2001,. Evans, Clement A., Confederate Military History, Volume III. Atlanta: Confederate Publishing Company, 1899. Warner, Ezra J., Generals in Gray: Lives of the Confederate Commanders, Baton Rouge: Louisiana State University Press, 1959,. Welsh, Jack D., Medical Histories of Confederate Generals, Kent, Ohio: Kent State University Press, 1999.